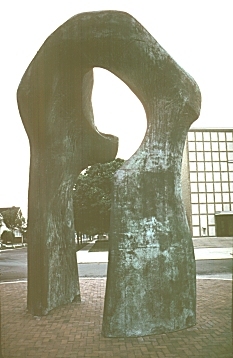 Images of Large Arch, 1971, by Henry Moore in Columbus, Indiana. Digital Imaging Project: Art historical images of European and North American architecture and sculpture from classical Greek to Post-modern. Scanned from slides taken on site by Mary Ann Sullivan, Bluffton College. Henry Moore's Large Arch is located on a central plaza with I. M. Pei's Cleo Rogers Memorial Library on one side and Eliel Saarinen's First Christian Church on the other. 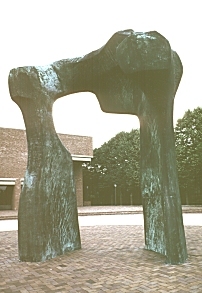 Other works on this site by Moore include: The Archer, Hill Arches, Large Four Piece Reclining Figure, Locking Piece, Seated Woman, Three-Part Reclining Figure, and Upright Motive No. 1: Glenkiln Cross.